Amritsar is no doubt a beautiful, and a culturally rich city, a city that takes you back into time, as you walk through its old narrow streets. In addition to all of this, one thing that sets the city apart is its delicious food loaded with desi-ghee. It doesn't matter how long you are in the city for, because there will always be so much left to taste and explore. In this post, I will share with you the foods and the restaurants that you must try when you are in the city. Started in 1916 in Pakistan, Kesar ka Dhabba has stood the test of time. It was shifted to Amritsar post-partition and has been able to maintain the quality of food since then. Order a thali when you are here. It includes Dal, Channa, Raita, and two plain parathas. You'll be so full after this one thali that you'd hardly be able to move. But keep the place for some dessert - Firni or rice pudding, a very different dessert not very commonly found in all parts of India. Breakfast at Kanha Sweets is just unbeatable. Start your day with puri, chhole(chickpeas) and potato curry. Everything here, starting from assigning tables, to serving plates, and finally serving food is a very streamlined process. The best part is that you pay per the number of puris you have (2 minimum), but you can have an unlimited amount of potato curry, chhole, and pickle. This is my personal favorite, reasons being - the place is closer to my home and second, I am completely mad about champ. Champ is generally made by baking marinated soya in a tandoor. 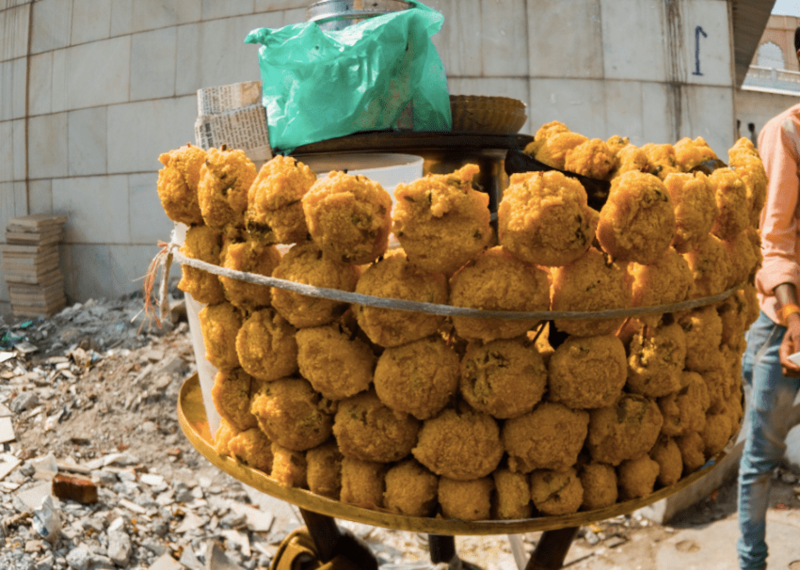 Generally served in the older part of the city, you'll find many vendors with small carts selling these salted laddoos. These are not the healthiest items or the cleanest food that you will eat, but they are just so delicious. The laddoos are served hot with some pickle and chutney for that extra tangy flavor.